It finally happened. The planets aligned in a way that allowed the Golden State Warriors to play in a semi-competitive game during the postseason. They won, of course, but for a little while, it looked like they might not. But they did—thanks to Kevin Durant. 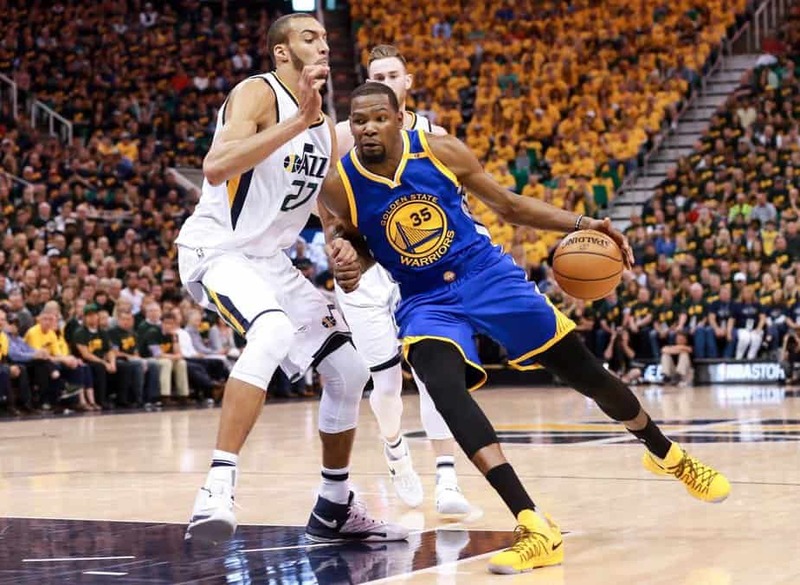 For the Utah Jazz (or anyone else) to beat the Warriors, certain things had to happen. For one, the starting five must play well–which Utah’s did in Game Three Saturday night. All five scored in double figures led by Gordon Hayward (29 points) and Rudy Gobert (21 points). They also needed Golden State’s superstars to have an off-night. Draymond Green scored just nine points. Steph Curry was a dreadful 6-20 from the floor and just 3-11 from three-point range for 23 points (8-9 from the free throw line). Klay Thompson struggled to hit any shots going 1-9 from the floor and 0-4 from three-point range. Make your own shots and hope that the Warriors miss their shots. That was the formula for beating the Golden State Warriors; not exactly a state secret. The Warriors were aware of this problem, so they did the smart thing after losing the Finals last season. They picked up the best free agent they could get—Kevin Durant. While everyone else had trouble hitting their shots Saturday night, Durant didn’t have too much trouble hitting his (38 points; 15-26, 4-8 from three-point range). With 13 rebounds to go with his 38 points, he became the first Warriors player to have back to back 25+ point/10+ rebound nights in the postseason since Nate Thurmond did it in 1972. 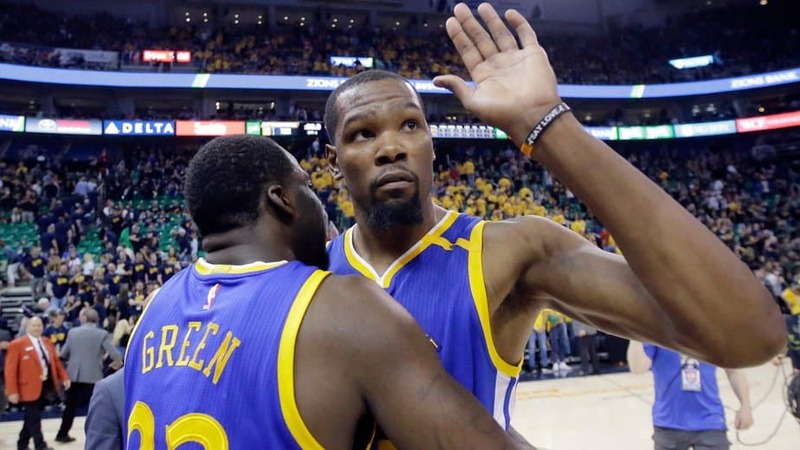 “When [Durant] started getting going early, I felt like it could be a big night for him, and it was,” acting head coach Mike Brown said. The game started off like all the rest. Golden State got out to an early 10-point lead, 27-17, after the first quarter. But then something odd happened. The Warriors missed shots, and the Jazz made them. By the time the second quarter ended, the Jazz actually held a one-point lead, 50-49. Crazy, right? Well—it got crazier. After a 12-4 run by the Jazz to start the second half, Golden State was down by nine points, 62-53. But the inevitable happened, the lead disappeared, and when the fourth quarter began the Warriors were ahead by two points, 72-70. Utah kept it close in the fourth quarter but with Kevin Durant and Steph Curry each scoring 11 points in the period, they didn’t stand a chance. Utah will get one more chance to salvage some pride in Game Four Monday night at 9 PM ET. But let’s be real—Utah doesn’t stand a chance. Cleveland is playing well, but do they have the defense to stop the Warriors? They did last season in the Finals but last season the Warriors didn’t have an inside scoring threat like Kevin Durant on the roster. Houston plays a similar style of offense as the Warriors, but their shooters are not nearly as good as Golden State’s. The Rockets also don’t have an inside threat that can pick up the slack when the threes don’t fall. Yes, Harden is good, but they need more than him–and don’t have it. Boston? They aren’t going to make it past Cleveland. That leaves San Antonio. The Spurs have the defense to put the brakes on the Warriors, but do they have the offense? Kawhi Leonard and company are capable of putting up some serious points but they are also capable of going ice cold. San Antonio is probably the team most likely to give the Warriors a challenge, but it remains to be seen if they are going to make it to the next round.